Join Our Core 2015 is seeking budding social entrepreneurs interested in giving their half-baked business ideas a helping hand with crowdfunding and marketing know-how. This year Ben & Jerry’s are especially interested in ideas relating to the issue of climate change, but all innovative ideas with the potential for positive social impact are warmly welcomed. As crowdfunding platform partner of Join Our Core 2015 in the Netherlands, Symbid will provide access to its community of over 29,000 investors and entrepreneurs to help spread the word about the competition. Five successful entrepreneurs will be given 20% of their crowdfunding total, marketing training, unique promotional opportunities and expert mentoring at the Ben & Jerry’s headquarters in Vermont, U.S. The application process closes on March 16. Residents of the Netherlands interested in applying can do so here. Founded in April 2011 as one of the first investment crowdfunding platforms worldwide, Symbid allows non-accredited investors to invest online in start-ups and SMEs with as little as $27 in exchange for shares in those companies. Based in the Netherlands, Symbid has emerged as a global leader in investment crowdfunding due to an innovative technological infrastructure, user-friendly interface and commitment to providing a secure funding environment for both investors and entrepreneurs. As of December 2014, Symbid has successfully funded over 60 start-ups for a total capital sum of $7,300,000. 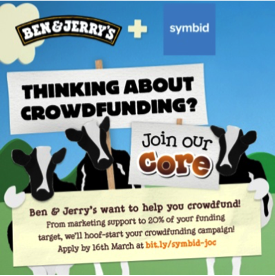 Symbid became the first publicly listed crowdfunding platform worldwide in December 2013 (OTCQB:SBID). In 2015 the Company is expected to expand its product portfolio with several new (alternative and traditional) financial products in order to develop the Symbid platform towards an online funding network. Meanwhile, Symbid anticipates a European roll-out of its investment crowdfunding platform in Q1 2015. Please visitwww.symbidcorp.com for more information.